The basis of our economic takeoff is certainly in agriculture and this is clearly a priority,” said His Excellency Ibrahim Boubacar Kéita, President of Mali to Dr David Bergvinson, Director General, ICRISAT, when the latter called on him while on an official trip to Africa. President Kéita said that 15% of the government’s budget was allocated to agriculture. “We are pleased that many compatriots have understood the importance of investing in the agricultural sector as a source of income and many ‘conversions to agriculture’ are happening to demonstrate this interest,” he said. 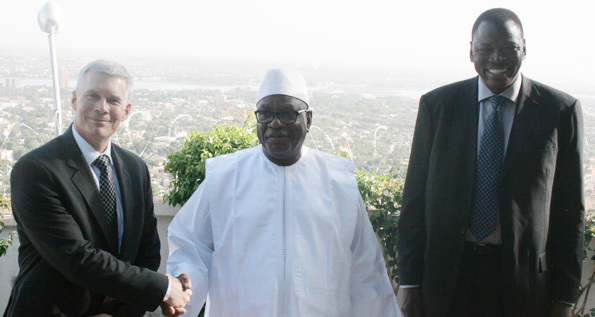 The Malian President also discussed climate change and challenges to land and water resources management. “Food sovereignty is important for a country and we appreciate ICRISAT’s work on family farming to help households improve their productivity, nutrition and livelihoods,” he emphasized. Dr Bergvinson spoke about translating the watershed management experience gained from India in West and Central Africa, especially in Mali, to target challenges with regard to water and land management issues. Dr Bergvinson reiterated ICRISAT’s commitment to support smallholder farmers through a demand-driven research for agricultural development to improve their livelihoods through a close partnership with Institut d’Economie Rurale, NGOs and the private sector. “As ICRISAT delivers science findings to farmers, nutrition of farming households, especially of women and children remain a key driver,” he said. He also stressed on the importance of strategies like Inclusive Market-Oriented Development that could enable better inclusion of youth and women in the agricultural sector. The Minister of Rural Development, Dr Bocary Tereta and Dr Ramadjita Tabo, ICRISAT’s Director for West and Central Africa, were also present at the meeting. We are comforted with new development in our collaboration for large scaling up of sorghum, millet and groundnut technologies, adapting to the effects of climate change. The challenge now is to transfer those technologies on a larger scale to family farms,” said Dr Bouréma Dembélé, Director General of Institut d’Economie Rurale (IER). The discussions between Dr Dembélé and Dr David Bergvinson centered around key impacts and major challenges affecting agricultural production in Mali. “Countries that depend on sorghum and millet for their consumption face great challenges due to climate change. 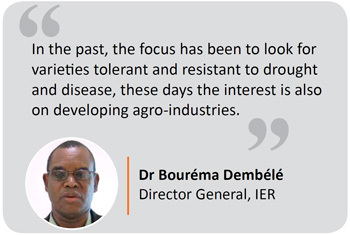 If in the past, the focus has been to look for varieties tolerant and resistant to drought and disease, these days the interest is also on developing agro-industries,” said Dr Dembélé. The collaboration between IER and ICRISAT currently covers 20 projects involving different aspects of agricultural research for development. Both institutes and partners were able to lead in developing a number of technologies which have impacted farmers’ livelihoods. Ways to further strengthen the bonds of partnership include capacity building, mentoring and internships. According to Dr Dembélé, the Mali agricultural development policy has two pillars: Cereals and livestock – targeting small-scale farmers and developing of ‘agriculture growth poles’ for rice, maize, millet, sorghum, livestock and aquaculture. During the meeting, seed certification and release were discussed as key constraints preventing scaling-up of varieties being developed. 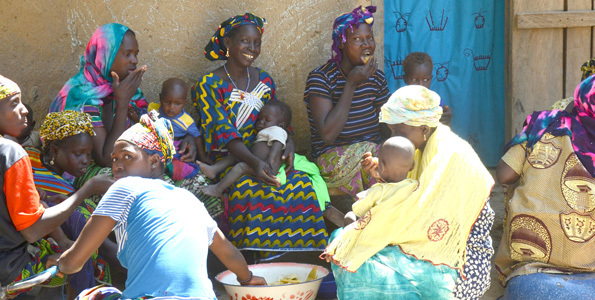 Another major challenge in Mali is improving household nutrition. 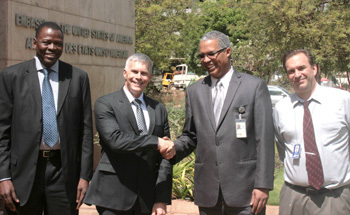 Mr Gary Juste (center), Mission Director for USAID, Mali and David Yanggen, Director USAID - Malé - Office of Economic Growth, and ICRISAT Director General, Dr David Bergvinson, discussed innovative partnerships for making technologies reach smallholder farmers. The role and importance of mobile technologies in scaling-up projects was one of the key topics discussed. “These technologies will be important in attracting youth and supporting commercial agriculture and help farmers connect to the financial sector,” said Mr Gary Juste. About 45 minutes from Niamey city is a village called Sadoré. The village is just across the street from the ICRISAT office and is a beneficiary of the diversification program which trains women farmers in tree grafting and raising nurseries. The women in Sadoré were poor, but by selling the grafted mango trees, they are earning well. They have built new homes; their homes have electric supply and they have TVs and refrigerators. They are also able to pay the school fees for their children and contribute to other needs of their families. A school girl explains the process of grafting mango trees. Ms Salamatou Boureima, the secretary general of the Women’s Association in Sadoré says that grafting trees allows them to earn an average annual income of 300,000 FCFA (about US$ 612). Some of the experts in grafting are students from the elementary school in Sadoré who are taught nursery and gardening activities. This activity that now benefits the entire village was due to the initiative taken by ICRISAT technicians and Dr Dov Pasternak (former ICRISAT scientist) who taught the women how to graft, tend to the plants in the nursery and sell them for a good price. Since 2006, the school was able to gain revenues from grafting. “A grafted mango tree costs about 1,000 FCFA (US$ 2). The activity has drawn clients from outside of Niger, mainly from Nigeria, who are ready to buy them for almost double the price. The money is used for purchasing school equipment,” says the headmaster of the school. 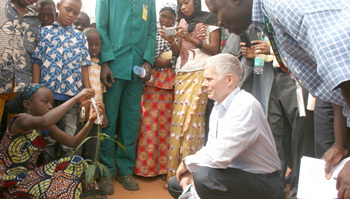 Dr David Bergvinson, Director General, ICRISAT, who is currently in Africa, met the women’s group in Niger. Mothers and children enjoy the nutritious Tô. A story about the An Be Jigi 2 project. An Be Jigi means “Hope for all” in Bambara. 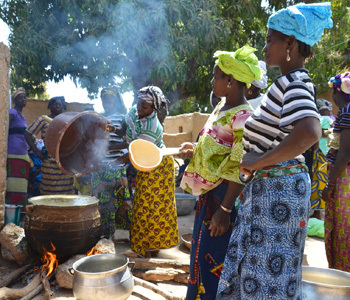 Aminata Sanogo, mother of four children, has sparked a cookery revolution among women in her village, N’golobougou, in South Mali. She cooks her Tô (a traditional porridge and a staple dish in rural Mali) with whole grain sorghum. Normally, a woman will be praised if her sorghum grains are perfectly decorticated after half an hour of incessant pounding with the pestle and mortar to remove the outer seed coat. Finding bran in the Tô is not acceptable and results in bitter remarks about laziness. However Aminata’s husband finds the whole grain Tô delicious and often invites people to taste it, jokingly warning that they must “be careful, this is the Tô with non decorticated “grain”. Aminata has been a facilitator of nutrition courses for the An Be Jigi project for four years, showing women how to cook sorghum and millet grains differently, such as using whole grain, so that the nutrition value of meals is higher as the seed coat contains vital nutrients that are lost when the grain is decorticated. Aminata Sanogo and Sitan Sidibe, family nutrition leaders from N’golobougou, Mali. Malnutrition is widespread in Mali, especially among young children in rural areas. Anemia is particularly severe, and iron deficiency is a major cause, leading to poor child health. The McKnight Foundation funded An Be Jigi project aims to prevent such malnutrition by increasing iron and zinc uptake through various strategies: selection of iron/zinc-rich sorghum and millet varieties (biofortification), change of cooking and feeding practices and better nutrition education among women farmers, most of whom are illiterate. The focus of research has been on sorghum and millet, crucial staple crops in the rural Malian diet, providing three quarters of the total energy intake of mothers. While cereals provide about half of the iron intake and up to 75% of zinc intake, the total intake of these essential minerals for child health and development is far below international standards. About half the mineral content of grain is lost through decortication (44%). Encouraging the use of whole grain would improve the quantity of mineral ingested and also ease mothers’ workload so they could spend more time on child care. However, the bran and seeds are rich in phytates, which are essential for germination and the main form of phosphorus in grain, but inhibit iron and zinc bioavailability. Yet bioavailability of these essential minerals can be increased by some food preparation methods like fermenting (soaking the grain overnight before milling) and adding vitamin C-rich ingredients locally available, such as tamarind or baobab fruit, which significantly increase iron and zinc uptake. Data shows that these measures could help increase iron uptake in children by over 50%. “Akadi, akadi!” (good, good! ), says Aminata as she sees how enthusiastically the women and children eat the Tô and nutritiously sweet millet and tamarind porridge she has helped the mothers prepare. This is the proof that women can change the way they cook, even the most traditional dishes, to improve nutrition and diet diversity if given the right information. Cookery session for better nutrition. So, how can we replicate An Be Jigi’s success elsewhere? Aminata has now joined forces with an equally energetic pioneer, Sitan Sidibe, a very active mother of ten children and grandmother of six, to spread the word. Convinced about the impact on children and women’s health, Aminata and Sitan have become nutrition experts for their community. They have just been asked by women from a village 10 kilometers away to organize the same cookery sessions. Even though they are not paid, they will go as they see benefits for themselves, what Aminata calls maaya-juru. In local Bambara language, this refers to making more acquaintances, which is highly valued in the very sociable Bambara culture. 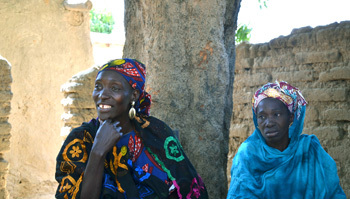 Training more women like Aminata and Sitan could create a nutrition revolution in rural Malian families. Women village nutrition facilitators like Aminata have been trained by Food Technologists from the Malian National Agricultural Research Institute, IER (Institut d’Economie Rurale). The Malian branch of the NGO Helen Keller International has provided pictorial training materials about basic hygiene and nutrition messages. Over the 8 years of An Be Jigi project, researchers from ICRISAT were particularly involved in defining the curriculum of field nutrition schools. Other valuable research outcomes of ICRISAT include a sorghum and millet breeding program on iron and zinc biofortification, and an understanding of the impact of grain decortication and other food preparation methods on the nutrition value of staple foods. It is heartening that positive changes are happening for some women in the rural sector – one of the toughest groups to reach due to the gender and social dynamics, poverty and low education levels in the villages. Years of research and sustained effort in the area of Integrated Watershed Management is creating a collaborative spirit and changing the lives of rural women in India. The impact of these initiatives has been captured through a sample study of women in remote villages in Madhya Pradesh, represented in videos being released for International Women’s Day. Get to know these women as they tell about the odds they had to overcome to emerge as leaders in their community. Hari Bai from Siyalwada village in Madhya Pradesh, India, knows how to deal with a fickle monsoon. The holistic approach of the watershed initiative equips her to help herself and others in her community too. Through the self-help group (SHG) that’s part of the watershed initiative, Hari Bai availed a loan to buy her first goat. She now has ten goats. The SHG also brought out the leader in her – she is the president of Shiv SHG in Siyalwada. Janki Bai from Dungaria, a remote village in Madhya Pradesh state, India, turned her barren 10-acre field and neighboring drylands into cultivable land by giving up an acre for a water harvesting pond. The watershed project helped farmers conserve rain water; grow new crops and better crops; and above all transformed their thinking. Sarda Bai lives in a village on the forest edge that receives abundant rain and yet faces water scarcity. Here’s the journey of a woman who started off as a laborer and is now a businesswoman and proud farmer. A fine example of how the model watershed project in Siyalwada, Madhya Pradesh, India, has transformed lives. Watershed work has been ICRISAT's time tested success story and needs as much popularization as possible. For the last 40 years it has produced successful crops every year, on the station and on-farm trials, a most successfully adopted technology. I hope all national programs adopt watershed based research as the basis for soil and water conservation programs and crop production.